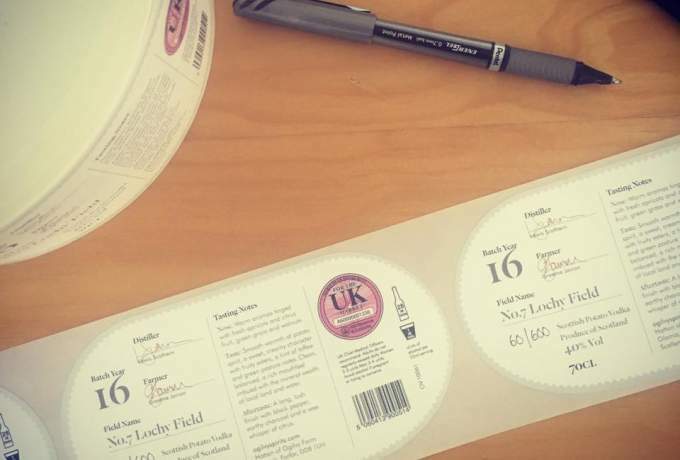 We have been busy hand-numbering our first batch of our Batch Year 16 bottles for release. We produce only 600 bottles in a batch, each are hand-numbered by Caroline and will be released soon for sale. Now into our third year release, many of you are collecting your favourite number from each year, which is great to see. Our batch year 16 potatoes are our 2016 harvest of Maris Pipers. These have been grown in No.7 Lochy Field, you can see exactly where the field is on the website, showing we have full tracebility from start to finish on our vodka. It's always exciting getting to this point in the year, as so much hard work has gone into cultivating these potatos for our super smooth vodka. Now we can celebrate with an Ogilvy on ice before the whole year's process begins again!